Thirty years ago, the Dia Art Foundation’s downtown gallery space in Soho commissioned two consecutive participatory art projects: Group Material’s Democracy, on view from September 1988 to January 1989, and If You Lived Here . . . by Martha Rosler, presented from January to April 1989. In lieu of more traditional, object-based exhibitions, Group Material and Rosler both opted to mount a series of thematic installations organized around pressing social issues: the former examined public education, electoral politics, the AIDS crisis, and the politics of cultural participation, while the latter focused on homelessness and gentrification, both of which remain primary concerns within her practice to this day. Spanning the tail end of the Reagan era and the beginning of George H. W. Bush’s first and only term, these projects not only bridged the two presidential administrations, they opened against the backdrop of major historical shifts on the domestic and global fronts: the launch of the First Gulf War, the expansion of the War on Drugs, the collapse of the Soviet Union and symbolic end of the Cold War, and, perhaps most saliently, the so-called Culture Wars, when the forces of reactionary conservatism (including politicians Jesse Helms, Alfonse D’Amato, and Pat Buchanan, backed by right-wing Evangelicals like Pat Robertson and Jerry Falwell) threatened to gut public funding for the arts in retaliation for the increased visibility of identity politics, alternative sexualities, and explicitly activist practices within mainstream art institutions. Faced with this complex cultural and political situation, Democracy and If You Lived Here . . . staked out new strategies for bringing artistic and political radicalism into closer alignment. Their installations de-centered individual authorship by combining artworks by the featured artists with work by local schoolchildren and community members, alongside a diverse array of found objects, printed ephemera, and pedagogical displays. Most significantly, both projects featured town-hall-style forums, hosted by Dia, in which members of the public were invited to participate in discussions on controversial topics, which often became heated and confrontational. By staging these real-time social experiments within the institutional space of Dia, Group Material and Rosler transformed the traditional exhibition format into a platform for democratic engagement, years before the vocabulary of “participation,” “platforms,” and “relationality” came to dominate the rhetoric of global contemporary art.1 In doing so, these projects tested the boundaries of what qualifies as an exhibition while also pushing back against the elite reputation of Dia, an organization that had only recently evolved from a privately funded foundation to a nonprofit. In recognition of their defiant stance vis-à-vis the commercial art world and their host institution, these projects have been widely recognized by scholars and critics of contemporary art (such as Claire Bishop, Grant Kester, Miwon Kwon, and Shannon Jackson) as artistic bellwethers, setting the stage for the emergence of social practice, “relational aesthetics,” and the experience-driven economies of contemporary curating.2 Yet, according to art historian Adair Rounthwaite’s illuminating and tightly focused study, Asking the Audience: Participatory Art in 1980s New York, the historical legacy and contemporary relevance of the Dia exhibition program from 1988 to 1989 is far more ambiguous and complex than this straightforward narrative of influence and canonicity allows. Rounthwaite argues that the central paradox of participatory art is the inconsistent and often fraught relationship between artistic implementation, historical documentation, and audience experience; in other words, a persistent friction between intention, archive, and affect. Thus, in Democracy and If You Lived Here . . . , she identifies an opportunity to revise the dominant genealogies of contemporary participatory aesthetics (especially as presented by Kester and Bishop) by recovering the ways in which audiences encountered, behaved within, and later recalled these projects. The result is a rigorously archival and compelling study that asks its own audience to reconsider how and why artists and institutions solicit audience participation, and what purposes this engagement ultimately serves. Throughout the book, Rounthwaite strikes a delicate balance between historical context, firsthand testimonials, and theoretical interpretation. Blending an impressive fluency in recent work in affect and queer theory with meticulous archival research, each chapter performs a close reading of a different dimension of the institutional and audience dynamics of Democracy and If You Lived Here . . . . Across these case studies, Rounthwaite investigates how the Dia projects engaged the public in the context of a rapidly gentrifying urban environment and an increasingly financialized art world. In contrast to a more heliocentric model of art history, which privileges the closed circuit of artist and artwork while bracketing that more indeterminate third term, the viewer, Rounthwaite deliberately shifts focus toward what she calls the “network of participation,” an unpredictable, unruly, and often indiscernable social variable that lends participatory art its content and logic. Moving beyond straightforward reception history, the author pursues a head-to-toe anatomy of how audience participation functioned in the late 1980s. This was a transitional period for both the art world and the Left, a moment that demanded new tactics and strategies distinct from those inherited from the 1960s, whether neo-avant-garde or New Left. Contextualizing the Dia projects historically and politically enables Rounthwaite to argue that these were not simply instances of activist art, but attempts to fundamentally remap the relationship between the artist, the institution, and the public sphere. By adopting the processes of direct democracy as both form and content, these projects leveraged the social currency of art as a “public good” to engage in politically challenging discourse and oppositional actions that extended far beyond the realm of the aesthetic. Thankfully, the author does not shy away from the contradictions implicit in staging artistic dissent under the aegis of Dia, an organization known for championing and funding the exorbitant creative ambitions of a select roster of mostly white male Minimalist artists, certainly not for showcasing politically engaged art by feminists, queers, and people of color, the demographics represented by Rosler and Group Material. Instead, the perceived incompatibilities between these artistic and institutional reputations emerges as one of the central tensions in her account and leads to fascinating behind-the-scenes revelations: for instance, that it was Yvonne Rainer who paved the way for these unlikely collaborations when she acted as an intermediary between the artists and the Dia board. Moreover, Rounthwaite recovers the mixed critical reception with which these now-canonical projects were met; many critics regarded the projects as unsuccessful experiments, or worse, cynical ploys to refashion the public image of Dia with a veneer of street-smart, radical chic. Arguably, this critical ambivalence has carried over into the current reception of much participatory art and social practice, especially when its more crowd-pleasing iterations are framed as thinly disguised attempts to boost museum admissions or gallery sales. Eschewing a more rose-tinted, affirmative account, Rounthwaite acknowledges the inconsistencies between the current art-historical status of the Dia projects and their uneven contemporary reception, and takes it as an opportunity to consider how the politics of participation may have changed between 1989 and today. With an admirable degree of authorial self-awareness, the book’s introduction articulates its methodological nuances and complexities while admitting its unavoidable aporias. Importantly, the primary research relies heavily on audio recordings of interviews and the town hall–style meetings, perhaps even more so than photographic and written accounts. This perceptual shift, from the visual and textual traces of the material archive to the auditory traces of the recorded voice, prompts a sustained reflection on the status of documentation in participatory art, where the presence of a recording apparatus inevitably impacts social dynamics by rendering its participants self-consciously aware of their induction into history. In foregrounding these purportedly more “subjective” auditory sources over the textual records presented in gallery press releases, artists’ statements, and extant narratives, the author challenges and destabilizes the status of these supposedly more official accounts, marshaling them as components of discourse rather than as neutral historical evidence. In this sense, Rounthwaite appears to have absorbed the lessons of Joan Scott’s landmark essay, “The Evidence of Experience” (1991), which challenged the disciplinary centering of first-person narrative as a primary source of historical evidence.3 Inasmuch as Rounthwaite agrees with Scott about the fundamental instability of “experience” as a category of historical analysis, by positioning this unstable category at the center of her inquiry she nevertheless risks elevating it to the status of historical evidence. But at the same time, this raises the question of what would it even mean to discuss participatory art sans audience experience? At best, it would result in an anemic account; at worst, a thoroughly fictional one. Rounthwaite grapples with this challenge by embracing the asymptotic relation to her object of analysis and allowing the category of experience to remain messy and difficult and perpetually shot through with loss and incomprehension. In doing so, she provides a model for how contemporary art history can redress the unavoidable gaps in that final frontier of analytic description: the psychic and phenomenological vicissitudes of aesthetic experience. Situated in the gap between social history and critical sociology, affect theory and the archive, Rounthwaite recovers a remarkable degree of historical and critical significance from a relatively contained subject, demonstrating her sharp theoretical acumen and mastery of contemporary art discourse. Asking the Audience will prove indispensible to scholars, curators, and critics of contemporary art, especially those invested in understanding how and why the participatory, dialogical, social, and relational have emerged as dominant cultural paradigms, even as the social and political problems that Group Material and Rosler identified and confronted thirty years ago have persisted, evolved, and arguably worsened in the intervening decades. In this sense, Asking the Audience arrives right on time, posing key questions about what audience participation—whether the deliberate activities of an engaged public (such as the town hall forums at Dia) or the involuntary behaviors of individual consumers (clicks, likes, metadata)—can tell us about the state of art and democracy. The next question to ask, as audiences and agents of 24/7 cultural participation, is not so much whether to tune in, turn off, and drop out, but instead, if the meaning of participation has irrevocably changed when any activity, choice, opinion, or preference can be stored, analyzed, monetized, and fed back to us instantaneously. As a high-definition snapshot of what cultural participation looked like toward the close of the twentieth century, Asking the Audience ultimately invites a deeper consideration of what it means today, at the dawn of the twenty-first. 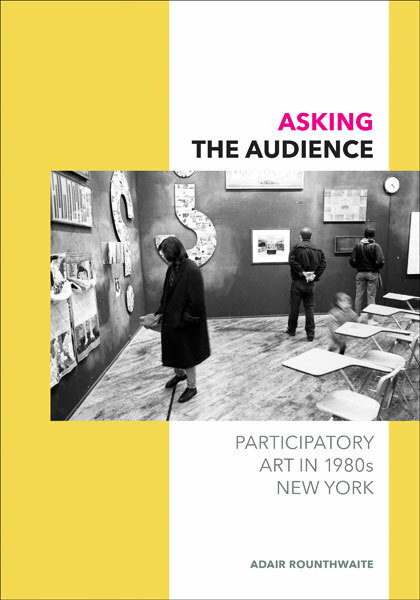 Cite this article: Johanna Gosse, review of Asking the Audience: Participatory Art in 1980s New York, by Adair Rounthwaite, Panorama: Journal of the Association of Historians of American Art 4, no. 1 (Spring 2018), https://doi.org/10.24926/24716839.1647. About the Author(s): Johanna Gosse is Visiting Assistant Professor and Scholar-in-Residence in the Department of Art and Art History at the University of Colorado, Boulder.